VIRTUALLY routed in the 1984 parliamentarry electionsthe BharatiyaJanata Party (Bip) made a remarkable comeback in the 1989 and1991polls. The party also came topower in four states in the 1989-1990state assembly elections:RajasthanUttar Pradesh (UP)Madhya Pradesh (MP) andHimachal Pradesh (HP). 1992saw the four BJP governments dismissed following the demolition of Babri Masjid in Ayodhya. The four states went to polls in November 1993along with Delhi. The party retained power in Rajasthan andcame to power in Delhifollowed by Maharashtra and Gujaratin 1995.  take special care in the import of technology, and promote research for developing indigenous pollution-free technology. It is clear from the agenda outlined that far from following aholistic approachthe Lar's prescribed solutions to environmental problems encompass just the technological (like antipollution devices). Strangelyfor a party which prides itself onits reverence for Indian culturepeople's traditions that preserve ecological well-being do not even figure in its concerns.The BIP keeps the issue of environment within the purviewof Centre-state relations and as a matter of sharing of powersbetween them. Party leader L K Advarn advocates more powerto states in this regard: "Our representatives in the states have been urging all the while that there is a need to take acomprehensive holistic look at the problem of environmentand that this be juxtaposed against the requirements of development. I also feet that laws should be suitably amended to letstates take most decisions in this regard." In agriculturethe absence of water regulatory systems and lowcost of power in the country has led to indiscriminate use ofthe two resourcesaffecting groundwater levels in the process.But in its bid to woo the farmer lobbythe l3pdoes not evenacknowledge these concerns as problems. The party manifestoes profess no strategies to tackle lowproductivity in diviand and tainted areaswhich occupy themajor percentage of India's agricultural land. The party'sfocus has remained on increasing the yield through irrigationand the states where the party has been in power are notoriousfor their ruthless advocacy of large dams; the project over theNarmada in Gujarat is an example. If I am permitted to do mining on five bighas (a state-wise variable land unit) of land, I can give 30 bighas toT plantations... but it will not be possible to fill people's stomachs with simply fresh air and forests,says Bfuiiron Singh Slickhawatthe Rajasthan chief minister. Given this viewpointit is notsurprising the BIP state governments have been resentful ofCenti at acts which regulate forest telling or any diversion offorest lands for development purposes; following strongprotests from chief ministersthe Forest Conservation Act1980- which necessitated Central clearence for diversion offorest lands - was amendedauthorising the state governments toclear upto five ha of forest lands for developmentpurposes. But the BFdoes not spell out how the national goal (whichit identifies with) of raising forest cover to 33 per cent of thetotal nation's area can be reached ifeach state is left to plan development projects bvitselfThe 1991 manifesto promised apew forest polic 'v based on a partnership between tribals andauthorities. But there has been no discussion on the community's say in the management of forest i esources or in theirequitable distribution. At bestthe party his talked of givinglimited US11finCt Tights to adivasis. In another instancethe former 11jichief minister of lipShanti Kumarwas accused of launching an official forest landgrab movement with his ifforestation scherne in February1991the Van Lagao Rozi Kaman Yojana. It promised two haof forest land each to around 750families who would plantsaplings and protect them in return for a trionthly incomeThe Congress(i) alleged tile scheme was politically motivatedas the targeted beneficiaries were allsupporters. The schemewas shelved with the government's dismissal. In Karnatakacritics claim the BJP's forest conservation drive is tinged with regional parochialismtakingshape as a programme for uprooting outsiders(Keralites who had come to the state in searchof livelihoods) from the state. Environmentalists question this 'holier than thou' attitudealleging that "in Coorg district aloneBJP workershad cut down around 10trees to block theroads during a bandh tall given by the party". The party has been trying hard to flaurit a greenimage in this sectorwhat with its opposition tocontroversial projects like Cogentrix andKaigaThe Cogentrix project is being opposedby the Karnataka Bit. "Wewantpowerbut notthe cost of environmentdeclares Anant Kumar. But the actual picture is not as simple. The Dakshina Kannada jistrict (where,Cogentrix will be located) BIP unit, has not been participating in the protests led by the party. The main reason for this apathy, apparently, is the BJP'S efforts to counter the influence of the district's dominant industrial house of the Pais, traditional supporters of Congress, by advocating the entry of mega industries in the region. While the party's emphasis on efficiency and renewable energy sources is laudable, the states ruled by it - instead of increasing efficiency - are on an energy production spree, The track record of the party in the states where it has been in 'power' is far from impeccable. It has been pushing for private investment in the sector, regardless of the environmental costs. in Rajasthan, theShekhawat government is making overtunes multinational power gencration giants for building the second phase of the Suratgarb4her 11il power plant. Besides, the state's Dholpur thermal power plant has been in the eye of the storm for several years now. it is feared that sulphur dioxide emissions from the plant would cause acid rains and affect Agra's Taj Mahal, while hot water emissions would spell the doom of crocodiles in the Chambal. Despite the Union ministry of environment and forests's (mrF) opposition to the project, Shekhawat,whowon hisseltfrom Dholpur constituency, had been personally pushing the project, which was finally cleared in 1995. With the BJP advocating tiberalisation of licensing procedures for industry, any attempt to streamline industrial activities subject to environmental clearance is like raising a hornet's nest. Shekhawat had vociferously opposed the environment impact assessment notification mooted in 1994 by the NfEF. The notification regulated development activities in all states in the interests of environment, and specified mining among many other industries requiring clearance from the Central government. NGOS point Out that despite the Supreme Court's (sc) stay orders on mining in Sariska, the Rajasthan government has issued fresh mining leases. Attacking the notification and the crivironniental movements in Rajasthan, Shekhawat had remarked angrily,What kindof environment are we talking about? Becauseof the Ranthambhore National Parkwe cannotdevelop Sawai Madhopur town; because of TajMahalwe cannot have the Dho)pur powerstation; and to save crocodileswe cannot builda hydropower project on the Chambal!" The party has been accused of giving cleanchits to politically favourabic polluting units inthe state. The Pesticides India Ltd factory inKhempuraUdaipuris an example. The factorywhich has been indiscriminately disposing offtoxic waste and other pollutants in the openisowned by Safl Singlialnephew of AshokSinghalBip leader and general secretary of theVishwa Hindu Parishad. The district administration has not shifted the factorydespite theRajasthan Board for Prevention and Control of Pollution's recommendation to do so. Rajasthan's time-tested indigenous water harvesting systemsare dying a slow death. Thestate had traditional systemscalled johads and khadmas -checkdams for collecting waterfrom small catchment areas -which served as water storagetanks as well as drinking watersources for cattle and were alsoused for minor irrigation.Besidesjohads helped in re-projectcharging well-water and in theimprovement of moisture content of the soil. Environmental degradation due to mining inthe state has taken the dimensions of a politicalfeud between the BJP and the Congress(i). ThewrangliDgs have led to an 'economics' verses'environment' rhetoricand the Bip hasin thiscasetaken a pro-economics stand. The conflict started in 1993when governorB R Bhagat disallowed two cement plants andlimestone mining in the state. Alleging thatBhagat's actions were politically motivatedthestate leadership of the party pointed out thatthe Congress(i) did not want BJP to take thecredit for generating employment from themining operations in the state.In a state where unemploymentis a major problemvillages aredivided over the ecological outfalls of mining. Those reapingits benefits support the activitieswhile the victims of ecological degradation protest againstthem. For examplewhen mining debris dumped in a canalnear Sangraha village inSirmaur district had washed'onto farms and damaged cropsthe angry villagers had taken theminers to court. With the mining lobby emerging as an electoral force in the statenone of thepolitical parties - including the BJP- wants totake a hardline position for ensuring safeguardsin mining operations. Cement is another major industry inHimachal Pradesh. Chief minister ShantaKumar's BIP government had announced thesetting up of four large and 12 small cementplants in the state. I he iup was euphoric whenthe NIEF gave its clearance to the GujaratAmbuja cement plant at Darlaghat; the projectwas controversial since a part of the neighbouring wildlife sanctuary was being denotified toprovide land for it. But local villagers wereunhappy as existing cement plants were knownto cause irreparable damage to crops: a cementplant in Sirmaur had shrivelled the region'scrops and grass under a heavy coating of limestone dust and caused fodder crisis. The tnp's clearance to cement plants hademerged as a major issue in the 1993 stateassembly electionswhich the Congress(i) wonmaking political capital out of the population'sgrievances against cement plants. But in powerthe Congress(i) has suddenly given sanction tothe three cement plants which the party hadopposed before the elections'. Political analysts claim that another factor- the influence of the apple lobby - cost theWits position in the state. A decision by ShantaKumar regarding the withdrawal of subsidies (on apple procurement) had infuriated thelobby. Interestinglynotwithstanding theswadeshi rhetoric of the BJPShanta Kumar'sdecision had been fuelled by consideration for aWorld Bank aid (linked with the conditionalityof withdrawal of subsidy). In its 1993 manifesto for Delhithe BJP coveredits environmental concerns under the curioushead of Environment and Beautification. Theemphasis of the programmeevidentlywas on'beautifying' Delhi by undertaking massive treeplantationdeveloping new 'picnic spots' =dmaintaining the old ones and controlling airwater and noise pollution. But for the appioximately 20 lakh peopleliving in the city's 3.8 lakh jhuggis (slums) andanother 20 lakh (1994 city survey) in unauthorised coloniesthese measures have meantnothing. 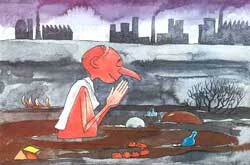 Industrial pollution is another causeof woe for Delhi's populace. Delhi's first masterplanprepared in 1961had envisaged a pollution free capital; todayDelhi is the fourth mostpolluted city in the world. The National CapitalRegion (NCR) master plan (1990) had kept athree-year deadline for shifting out pollutingindustriesas ordered by the sc. Instead of making any progress on this frontthe Delhi government started providing ad hoc licences tothese illegal units; it also stopped the previously followed practice of disconnecting electricityof polluting units. The sc bad ordered the shifting of 9164polluting units (out of which 170 are hazardous) located in the non-conforming zones in Delhi. Notices sent to these industries by theDelhi Pollution Control Committee (DPCC) didnot achieve much. A DPCC reportfiled in the 5c in August1995says there are about 930industries inDelhi. Many of these units emit hazardoussubstances - like sulphur dioxidelead andsodium - and use highly polluting rubber asfuel. A year agoSiraspur village had come intolimelight for deaths of cattlebesides healthproblems for humanscaused by lead smeltingunits. It took a disaster to close down Siraspur'slead unitsbut several such lead smelters areoperating clandestinely in the city today. Rumours are rife about how the smelterforced to close shop in Siraspurhas set upbusiness in another village - Mundka -where the present chicfministerSahib SinghVermahails from. The Delhi government hasdone precious little to safeguard the surrounding populations or the workers who work inthese sinelthig unitsCynics point out that theinaction is but to be expectedwhen industryminister H S Ballihimself is allegedly shelteringan illegal factory for electroplating cooking ovens and metres at his residence. Another example of the same ilk is that ofthe silica-rich illegal Bhatti mines near Delhiwhich had been shut down and the areadeclared a wildlife sanctuary by the late PrimeMinister Rajiv Gandhi. But M L Khurana's Bipgovernment in Delhi reopened the link roadspassing through the sanctuaryallegedly for thebenefit of illegal contractorsone of whom wasRam Chander Baindaa party candidate for alegislative assembly seat in Haryana.